Atkins's background as a writer of artistic splatter moviesAhe worked on the first Wishmaster film and three Hellraiser filmsAis obvious in this fast-paced but disjointed horror-suspense novel, first published in the U.K. in 1992 and now receiving its U.S. debut as the launch title for Stealth Press. A serial killer who signs the word Morningstar in the blood of his decapitated victims is stalking the streets of San Francisco. Donovan Moon, a flat-broke freelance journalist, gets a tip from a friend that Morningstar's crimes are marked by one other notable detail: his victims are all staked through the heart, killed as legend says vampires must be slain. A fortuitous phone call takes Moon to the penthouse apartment of Jonathan Frost, highly respected real estate developerAwho also claims to be Morningstar, aka Matador (the Spanish for "slayer"). Frost dreams of a hunter on his trail, and fears he will not survive their meeting. He offers Moon $50,000 to write his life story if he dies. Overall, the text reads more like a film outline than a novel, but Atkins knows how to tell a story and keeps this one thrumming with tension. Devotees of dark suspense will find it to their liking, and it's a good bet for the big screen. (Nov.) FYI: Stealth Press, which launched on November 1, offers high-quality bound books sold direct from publisher to reader on the Web. Other November 2000 Stealth releases include reprints of Peter Straub's Under Venus, Robert Vaughan's The Valkyrie Mandate and Robert H. Fowler's Jim Mundy. A serial killer is stalking the city and leaving viciously mutilated bodies. One desperate reporter is dragged into the story and reports what he is told. The killer has struck far more than the dozen times currently believed. Far more. But these recent killings are a warning and that is why he signed them with the name Morningstar. Something is going to happen soon and the killer does not know what. All he knows is that he has been hunting vampires (the real ones and not those of legend) for many years and something wants to stop him. The reporter is enlisted to report on the events after they happen so that the world will know that vampires are real and need to be dealt with. But is the killer right? Are there really vampires? If so, were his victims really vampires? Does any of it really matter? A very nicely told tale. Certainly not what I was expecting from the blurb on the back. I was expecting cheap escapism and found an intelligently written story that examined reality and our perceptions. Far better than the packaging would lead one to believe. I just discovered this fast-paced thriller and read it all in a couple of sittings. What sets this apart from other books is the way Atkins keeps us glued to the page, never quite revealing if this a supernatural vampire novel or one of a psychopath with an obsession of misguided murdering. Beautiful writing and a unique and interesting story. Morningstar alias the Matador alias Jonathan Frost is a successful San Francisco businessman -or +so the world thinks.This is actually a front for his real mission in life which is vampire slaying .He seeks out and destroys them having by his own estimate despatched over 300 victims in a 30 year killing spree . A good guy ,you might think .Atkins however shows him as a merciless and utterly callous killer .The Morningstar apellation comes from his daubing the word in blood and excrement on the walls next to the remains of the victims .The Matador tag is how Frost sees himself -a sportsman dispatching the creatures in single combat as in a corrida. He tells his tale to Donovan Noon a young and struggling journalist on the proviso that his tale can only be published on Frost's death ,and so that others will aspire to follow him down his chosen path .The tale realtes how Frost's cousins' daughter was slain by a vampire when Frost was just 16 and how this set him on his self-appointed mission to destroy vampire kind .At least one of his victims is innocent however ,one Chris Tempest and Tempest's friend Shelley Masterton sets out to bring Frost down . There are simply too many scenes in the book which go nowhere and Atkins shies away from dealing directly with the crux of the story -is Frost actually killing vampires or is he merely a deluded psychotic .The violence is frequent and graphic ,but these scenes are interspersed with ones of genuine lyricism and power . Atkins originally wrote a novella called Vampires of Summer that later became Morningstar. 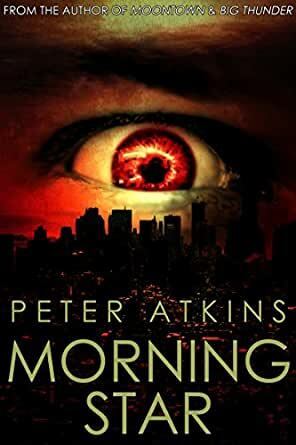 Atkins may have given us those Hellraiser sequels, but Morningstar introduced me to his fiction writing. I now know why this author is so well respected. Morningstar combines the best elements of horror, dark fantasy, sci fi, and drama with the creepiness of a great vampire/sociopath/ghost story. Get the picture? It is, indeed, a bit more complicated than the description on the dust jacket. Donovan Moon, freelance journalist, can't resist a fantastic scoop when he is called on by Morningstar to write the vicious killer's story. Morningstar has been a busy vampire slayer, but is he the only one who "sees" that his victims are vampires? He chooses to slaughter these vamps in the most unsavory of ways, and we learn more about him as he dictates his story to Moon. Shelley Masterton (is this name a coincedence? I think not) is the young woman whose friend is slaughtered during a Morningstar spree, and she finds herself at the center of a mythological, universal, and downright bizarre fight for life and justice. It's quite difficult to pin this novel into one neat category. Atkins crosses genre lines here, but it all works. I was [drawn] into the story almost immediately, and I kept turning those pages until I was finished. The story has tons of gore, wonderful characters, and almost magical writing. This one is definitely worth the read. Pass up the paperback version because the trade hardcover from Stealth Press is beautiful. 5.0 out of 5 starsHorror/Dark Fantasty at it's best! Peter Atkins, the author of such favorite popular horror features as Hellraiser II, III, and The Wishmaster, demonstrates here why he was chosen to co-write with undisputed modern horror master Clive Barker. A serial killer is loose in San Francisco. Ritually dismembering men, women, and children alike, the public is terrified and the police have no leads. The murders are all linked by bizzare mutilations and one word written in blood at the scene of all of the killings- Morningstar. Peter Atkins skillfully weaves a tale of grisly facination and edge of your seat suspense. This novel is brilliantly written, breaking conventional horror stereotypes with ease as it lures the reader further into the tale. Each page becomes a tangle of understanding, shifting the idea of who the victim actually is, and eventually leaving it all to the reader to decide. This novel has been out of print for a number of years, and has only recently been brought back to us through the efforts of Stealth Press. ([...]) This beautiful hardcover came highly recommended and left me dazzled with the brilliance of it's writing and the twists of plot that I couldn't put down. In a genre that's easy to get bored with as the stories begin to look vaguely the same, this novel will remind you why you started reading these stories in the first place.